The title still says it all. That portfolio is not necessarily diversified (i.e., no consumer stock sector) but it’s a start! I wrote this post almost six years ago. I believe it remains relevant today. Let’s compare 2011 to now below. Let me know if you see any themes. Images courtesy of BMO’s site. Images courtesy of CIBC’s site. Images courtesy of Royal Bank’s site. Images courtesy of Scotiabank’s site. Images courtesy of TD Bank’s site. I recall iShares XIU was one of the world’s first ETFs. 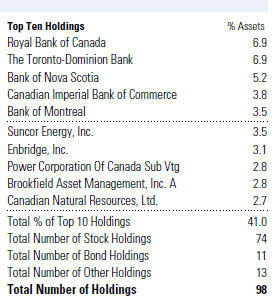 It holds the largest Canadian companies. My perspective is, if collectively the largest 60 companies in Canada aren’t making money year-over-year, nobody is. This ETF has provided strong Canadian market returns over the last decade and remains a great choice for your indexed portfolio. That said, the top holdings in this ETF rarely go out of style. Image courtesy of BlackRock’s site. 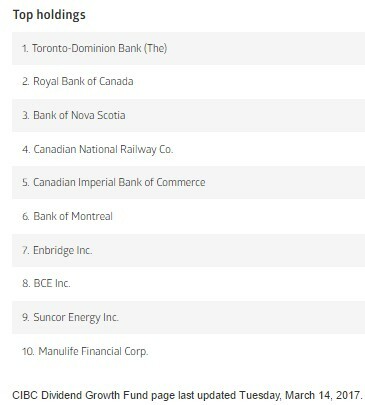 Have you noticed anything interesting about these top-10 holdings? 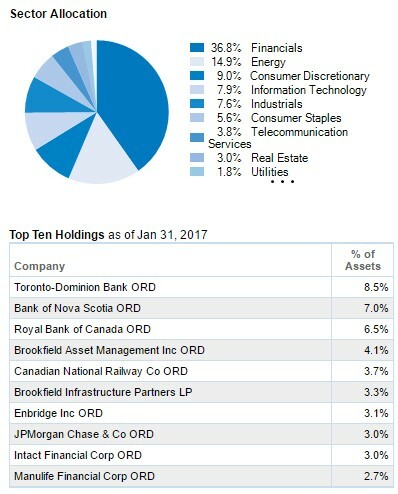 What do you make of starting your Canadian stock research through owning what the big funds own? 29 Responses to "Canadian Dividend Stock Selection Still Made Easy"
tWhat is the point of spending the time to create and manage your own dividend stock portfolio which in the end only mirrors any number of ETFs? The expenses of owning a dividend ETF are trivial and the time required for oversight is precisely zero. I think this makes great sense for the U.S. market, own a U.S.-listed ETF or international ETF. I’m not yet convinced the Canadian market is that difficult to figure out – via owning your own stocks for 3-4% steady yield/income plus capital gains. The time to monitor my stocks might be an hour per year. Maybe. Also, I am not convinced dividend ETFs provide the dividend growth you would get with individual stocks. I have sense that if I hold a dividend ETF with a 4% yield today, it will have the same yield 10 years from now and hence my yield on cost didn’t change. Hopefully I am wrong and maybe I am misunderstanding how the dividend ETF would work. Any insight on this Mark? Ultimately it’s total return that matters (combo of dividends + capital gains). From what I can glean from (history) for many dividend ETFs, they fail to keep up with most total return indexed ETFs over time. However, the last 10-years or so have been good for dividend ETFs and dividend stocks in general. 2. Do you own more total, broad-market assets in your portfolio (i.e., you’ll need to sell those assets to give you the income you need). I prefer a bit of both hence my strategy = own many dividend paying stocks and own U.S.-listed ETFs. Best of both worlds! What are the ETF management fees for a $1M (or higher) portfolio v. owning the stocks directly. 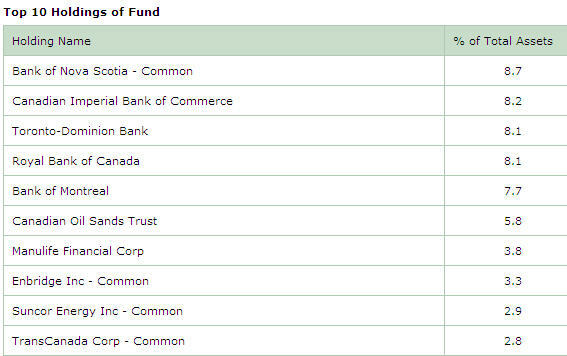 Say your dividend ETF, not that you would have it all in Canada anyhow, costs you 0.5% on average. That’s $5,000 per year on a $1 M portfolio. Small potatoes? Not really. Then have transaction costs to sell on top of that. VYM and HDV at this time, are the only U.S. dividend ETFs I will consider. Say $250,000 invested will cost only $200 per year. That’s decent money spent for diversification with your 3%+ yield. So that’s $200 per year every year for as long as you hold those ETFs. After 20 years that’s $4,000, compared to owning 25 individual stocks which would cost $250….even after being held for 20 years. That’s an increase of 1600% in fees. As others have pointed out 25 stocks in Canada is diversification enough, if not you could buy 50 stocks and still pay less in fees. Selecting individual stocks isn’t rocket science. Just buy quality dividend paying stocks when they are undervalued. Stock is undervalued when it’s current dividend yield is greater than it’s (10 yr) average dividend yield. Very true, but it’s pretty much impossible for the average investor to hold >100 stocks to be modestly diversified. Investors need to invest outside of Canada to reduce risk. This is where I personally find U.S. listed ETFs like VTI, VUN, VXC, VYM, HDV, etc. good for both income and capital gains – to be diversified from around the world. You pay a fee for it yes but it’s small when compared to other opportunity costs of underperforming the market or risking all your money in Canada. 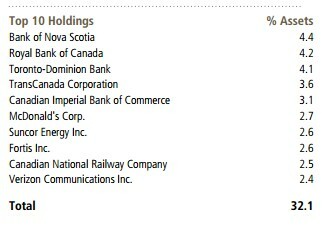 That said you know I’m a fan of Canadian dividend paying stocks; so I do own many of them for income and likely always will. Simple, XIE or iShares S&P/TSX Composite High Dividend Index has returned exactly 0.00% in 7 years. In mid 2011 the price was 20 dollars a share, today it sits at 18. Sure you get some dividends but you don’t get the growth. Total return might be higher but I don’t have the inclination to try and calculate it. In the same time frame TD (my bank) has doubled in price. I wouldn’t own XIE personally due to the fund’s modest to high ROC (return of capital). Recall – ROC = portion of a distribution that does not consist of dividends, interest or realized capital gains. Basically, you could be getting some of your own money back. Not good for growth! Well thanks Rob!! Happy Holidays. Although I think that the main part of a Canadian stocks portfolio shall likely be large cap blue chips like banks and pipelines, the Canadian market is very inefficient as most ETFs don’t include stocks with less than an 500 M$ float. Only exception to this might be XCS, as it’s the small cap index. On the other hand, it’s probably better this way as the stocks would see big swings on the days around rebalancing of the ETF (and some hedge fund would likely buy in advance all the stocks which will be added to an index and sell short these which might get dropped, reducing returns for all ETF holders.) Also, for many large investment funds, researching and buying small companies isn’t worth their efforts as it will barely move the needle due to the small amount of shares they can buy at once without affecting the price. Telecoms and REITs likely won’t provide much share price growth, especially in this rising rates environment, but their earnings are rather predictable and you can find a few of them undervalued at any given time. So this can be a worthwhile addition to a portfolio even if only a small part of the index. You can buy industrials for exposure to growth of ressources prices, building of roads, new construction, for a lower risk than buying directly the miners and builders. Also, the focus doesn’t have to be on dividends. Although dividends are popular nowadays, buybacks are another way that a business can return money to their shareholders. By buying and canceling shares, they increase the value of each remaining share without creating a taxable event. Some stocks such as small cap tech, small cap healthcare, junior mining, etc. can make it big on their own, be acquired at a premium, or just burn through their cash reserves and destroy shareholder value. Some will 10x while others will sink to zero, so depending on where one is in their investing journey and their hunger for risk, one can choose to have more or less of them. Overall, I think you might want less energy (you can keep integrateds, but don’t double down on exploration) and less miners than the index when nearing retirement. So basically I think it’s easier to either ‘find alpha’ or lower beta in a small and inefficient market like Canada, compared to US or EAFE markets if one is willing to take the time. I’m not saying it’s worth it for everyone as the hourly rate is likely very low for the size of most portfolios. Some people have ‘the knack’ for such research while others will prefer spending time with their family, playing golf or riding a motorcycle, so it’s worth it only if you enjoy the process (and track your results to confirm if you’re any good at it). This is faulty thinking. To get a tight correlation between “the largest 60 companies” and the “nobody” companies, you would have to have a very long time frame (25+ years, two full business cycles, etc. 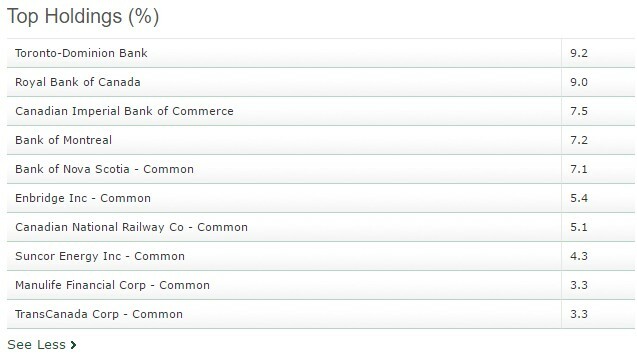 ), and compare only public companies. By the time the comparison is done, all you end up with is large/mature corporations, all of which — stab in the dark — might have profit margins within a similar range. But what of smaller and/or private enterprises which might have a profit margin 2-3x that of the largest companies? * Or the supra-enormous companies such as Amazon which literally make almost no profit yet have year-over-year stock gains that crush the largest 60? Indicies (and the reflective funds) are based on market cap, not “making money year-over-year”, e.g. Valeant, Enron, Worldcom, et al. Other funds, such as every pension fund, puts money into these largest cap companies — NOT the ETF/index fund — simply because they have too much money to funnel into smaller companies which might have more profitability and/or profit when the largest 60 are not. Those top picks are more for stability than anything. Don’t forget, the individual investor can do things which the large investor cannot (and vice versa) and largeness does not automatically beget largess. My context is…if the biggest companies in Canada are struggling to survive, the majority of other companies will as well. Big, multi-national companies make money. Plain and simple. They may not be overly productive in your context, and I would agree, but they are huge market cap companies largely because they make money and lots of it. Such picks are for the most part, stable, and as an index as stable as they can be since indexers are not immune to market calamity. I agree that some large caps might have most of their growth behind them, at some point there’s a limit to organic growth, and acquisitions require a ‘prey’ of the right size. Not too big as to concern regulators, but big enough to increase earnings in a short time. Over time, my VSN shares became PPL, my MBT became BCE, ONR.UN went private, etc. They didn’t get that big as buinesses, but total returns were great. So yeah, there might be something more to the small and mid cap shares. It could be the banks that buoyed the index during years where others were losing money. 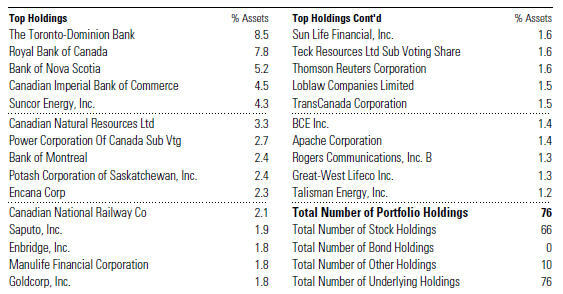 It’s all the same Canadian Blue Chip stocks that come to the top. Canada is such a small potato in the big picture … There is probably 20 or so stocks that they will all buy and that’s all you need when it comes to the Canadian market. As another reader just pointed out, all the big pension plans have to put their money somewhere … and they can’t invest 10B in a company worth 500M so the money goes around within the same companies. 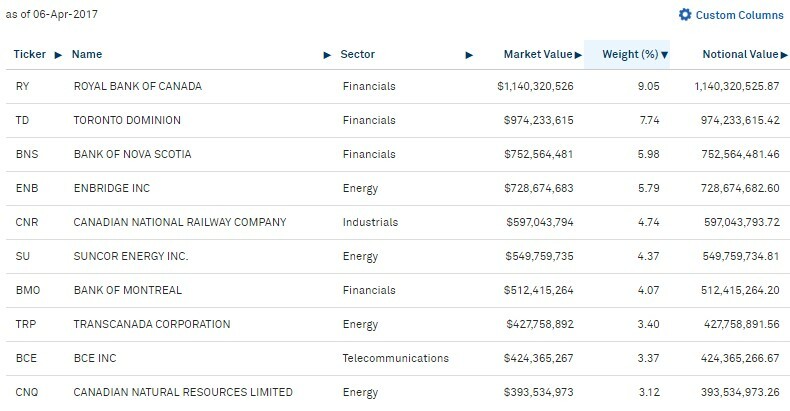 There are really 2 dominant sectors in Canada: Financials & Energy. You need to go to the US for Healthcare and Technology. Agreed – Canada has financials and an energy that always comprises >50% market weight and to a lesser extent, telcos, materials, industrials and utilities of <10% weighting each. You can own the top 4-5 stocks in each sector and then strongly diversify your assets in the U.S. and abroad after that. Nothing wrong with indexing in Canada but I’ve decided it’s not for me at this time. As a newbe to investing, I have always wanted to know how to figure out how you know when a stock is “undervalued”, so after reading the above line from Kanwal, where do you go to get the info and can you show an example. I know that this is probably basic info for most of your readers/ followers. 2. I also look at higher yielding stocks, to a point, because that means their prices might be out of whack with their historical yields. 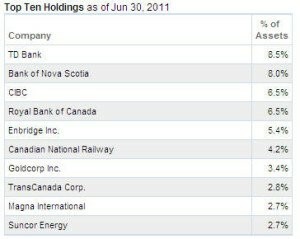 Some examples of stocks I find are “decent” value now in Canada are CM and POW. Again, I look at many other metrics but the goal of my post was to give readers insight into how I think. Your mileage may vary. Thanks for being a fan. I actually don’t think “undervalue” is subjective. It’s very clear, on any given day a stock is either undervalued or overvalued. The stock’s current yield is either going to be greater or less than it’s average yield. If the stock prices continues to drop over time, the dividend yield will go up. On the other hand if the stock price continues to rise the dividend yield will decrease. All things considered equal it would be better to purchase the stock at $20 rather than say $100, the higher the dividend yield the better. Therefore as we’ve seen historically TGT’s average yield has been 2.65%, and today it is trading at 4.39% which means historically it’s stock price is low. This is a similar approach to looking at stocks trading below their historical P/E, but looking at historical dividend yield provides a more accurate measure since it takes into account the dividends. I could go into more detail, but that would result in a much longer reply. For anyone interested in learning more…..Geraldine Weiss does an excellent job of explaining this concept in detail with lot’s of examples in her book “Dividends Don’t Lie: Finding Value in Blue-Chip Stocks”. Again this isn’t the only metric to watch, see my previous reply where I list my 12 Rules, you’ll notice it also takes into consideration a low P/E value. In the last 18 years I have not purchased any stock when it’s current dividend yield was less than it’s average dividend yield, and this has served me well. Hopefully it will also help others in making wise investment decisions. So…all things considered equal it would be better to purchase the stock at $20 rather than say $100, the higher the dividend yield the better but as you well know you need to be careful with high yields. 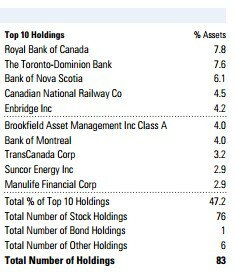 High yields on Canadian bank stocks are a temporary concern. High yields on companies like CPG in the past are not good! Since 4.47% > 2.65% the stock is undervalued today. I prefer to use the 10 year (or longer) average dividend yield, but I haven’t found a free online source that provides that 10yr value. If you are looking to quickly determine if a stock is undervalued the 5yr average yield will do. But if you want to get really technical, you could go to Morningstar.com and calculate the 10yr average yield yourself for each stock. Great detailed reply on your rules Kanwal. Thanks for sharing. Thanks to both of you for your explanations / perspectives. I will have to hard copy this info and keep and read over and over. Welcome Tim. As you can appreciate, Kanwal has more rules than I do. Goes to show you even though we both like dividend paying stocks, everyone is different. Thanks for being a fan.